“Leaf powder” is a scale-like vapor-deposited fine powder having a nano-level thickness. It has the large specific surface area and achieves a high aspect ratio (particle diameter/thickness). This shape property shows the excellent design effect, for example in painting and printing. It ensures a precise impression and a “flip-flop” feature in coated film. 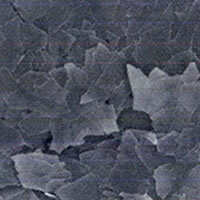 Additionally, through the multiplier effect of individual material characteristic, the leaf powder can be applied to conductive, electronic or cosmetic materials. Furthermore, it has the potential to serve in clean energy and might lead to the birth of a new functional material. Photoluminescence (plating substitution), flip-flop, high coating, barrier, catalyst activity, thin-coating layer creation, anisotropy, complex of features, etc. Metals such as Ag, Au, Si, Ti, Ni, Sn, In, Pt, Cr, etc. Compounds such as SiO2, Al2O3, ZnS, ITO, TiOx, etc. 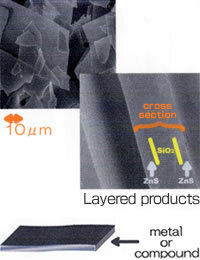 Layered products such as ZnS/SiO2/ZnS, In/SiO2, etc.